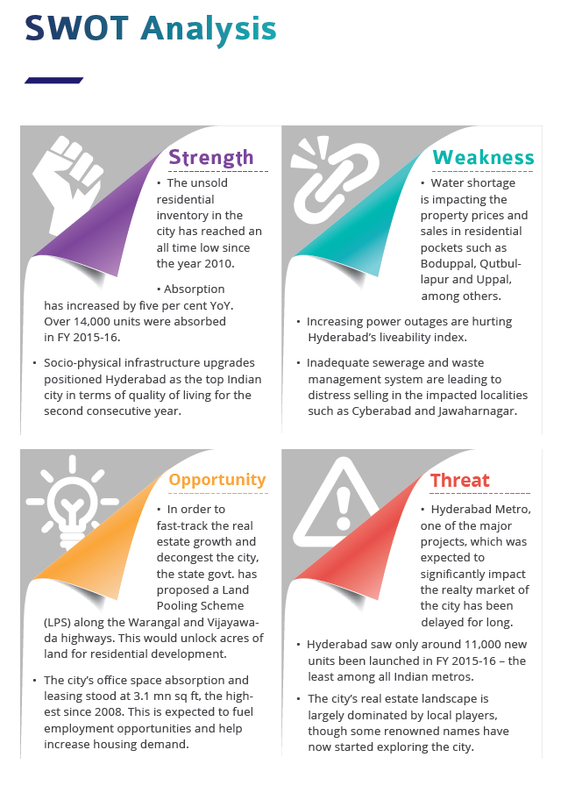 While capital values plateaued in Hyderabad in the last quarter of FY 2015- 16, the year ended on a positive note. New players are venturing into the city’s residential and commercial landscape and absorption of housing units is healthier than most Indian metros. Majority of the transactions taking place in Hyderabad are in the range of Rs 30-60 lakh. 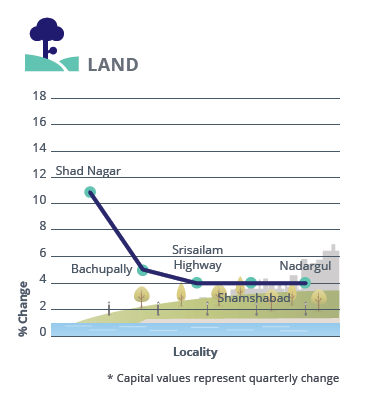 Thus, on the account affordability, areas along the Mumbai-Hyderabad Highway such as Kothaguda, Pragati Nagar, Nagole and Nizampet have seen capital growth of four per cent each, QoQ. Another major factor currently impacting the city’s realty is the availability of ready-to-move-in properties. To this end, areas such as Gachibowli, Miyapur, Madhapur and Banjara Hills are commanding a premium over other localities. Mirroring the apartment picture, the average capital values of residential plots in Hyderabad, too, did not post any growth QoQ. Localities such as Adibatla, Mokila and Bibi Nagar witnessed a price correction due to limited demand for plots. South Hyderabad witnessed the maximum number of transactions for residential land in the city. Pockets such as Shad Nagar, Nadargul, Shamshabad and other localities along the Srisailam Highway have remained in the forefront witnessing a rise of 4-11 per cent in the ‘ask’ prices. The proposed Land Pooling Policy by the state government, if implemented, is expected to majorly impact the plot prices along the Outer Ring Road in the coming months. The rental market of Hyderabad noticed a four per cent growth YoY (Jan-Mar 2016 vs. Jan-Mar 2015). Improvement in the commercial segment can be attributed to the growth in the rental market of Hyderabad. Evidently, areas close to the corporates have witnessed healthy rise in rental values. Hi-Tech City has seen a rental appreciation of 15 per cent in the last one year. On the account of the ever increasing demand, landlords here have managed to increase rents significantly. Similarly, Madhapur, Kukatpally, Kondapur, Manikonda and Chandanagar, all have witnessed a rise in rental values. While buyers are willing to move further from the core city, tenants are more than willing to stay close to their offices, even if it means hurting their pockets more. Ameerpet, the hub of educational institutions in Hyderabad, is another locality where landlords have increased the rental rates in the rental market. In the last one year, the locality has seen a rise of nine per cent in rental values. Perpetual delay in the construction of the Hyderabad metro led to rental rates stagnating in localities close to the transit corridor. 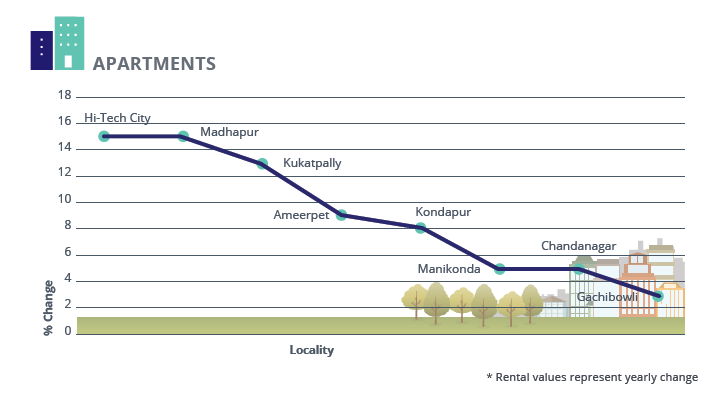 Miyapur and Tolichowki are two such localities where rental rates plateaued in the last one year. 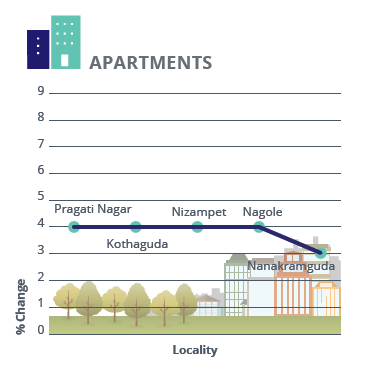 A few other areas which recorded stable rental rates include areas such as LB Nagar, Nagole, Uppal and Mettuguda. Premium localities such as Banjara Hills and Begumpet posted a decline in values over the last one year, primarily due to exorbitant rental options. Tenants spilled over to neighboring affordable localities. 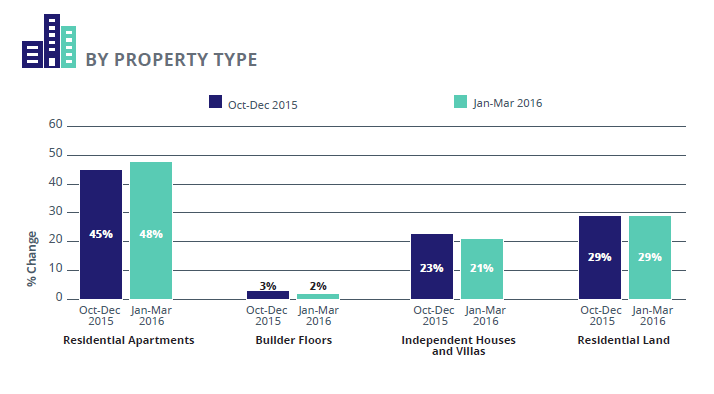 Under-construction properties have dropped significantly in Hyderabad in the first quarter of 2016. Transactions have remained steady, allowing the city to register an overall improvement. The city witnessed an increased demand for 4BHK units, driven by the need for a better lifestyle. Ready-to-move-in residential apartments are majorly available within the budget of Rs 25-40 lakh while under-construction flats are mostly concentrated in Rs 40-60 lakh budget segment. About 50 per cent of the total under-construction apartments are configured as 3BHK units. Builder-floor units are majorly available in the mid-income housing segment. Nearly 60 per cent of the total supply constituted of 2BHK units. And, one third of the total supply of independent houses/villas was available in the budget bracket of Rs 1-5 crore. Residential land formed about one-third of the total supply in Hyderabad. Majority of this property type is budgeted around Rs 25 lakh and available in the outskirts along the Outer Ring Road, in areas such as Mokila, Bibi Nagar, Adibatla, Shad Nagar and Shamshabad. Over one-third of the total supply in Hyderabad is concentrated in the affordable housing (Within Rs 25 lakh) category with residential land forming the major chunk. It is followed by the the mid-income and high-income housing segments. Currently, majority of the transactions taking place in Hyderabad are in the mid-income and high-income housing segments. New launches too have majorly taken place in the same categories. Despite a slight increase in the number of transactions in the ultra-luxury housing category, the segment has one of the highest unsold inventory. Supply majorly concentrated in the core areas such as Banjara Hills, Jubilee Hills, Himayat Nagar, Maredpally and Hi-Tech City. Demand for 4BHK units in Hyderabad has witnessed a sudden surge with businessmen and top management looking to upgrade their homes and lifestyle. Over 60 per cent of the 4BHK units are available in the budget of Rs 1-5 crore. While the supply of 1BHK is negligible in Hyderabad, demand for such units has increased majorly in the core areas, where property prices have gone out of reach. Currently, maximum demand in the city is for 3BHK units, with IT professionals forming the majority of the buyer base. Those who cannot afford to buy such units in core city areas are on the lookout along the outskirts that have a good approach to the city centre. 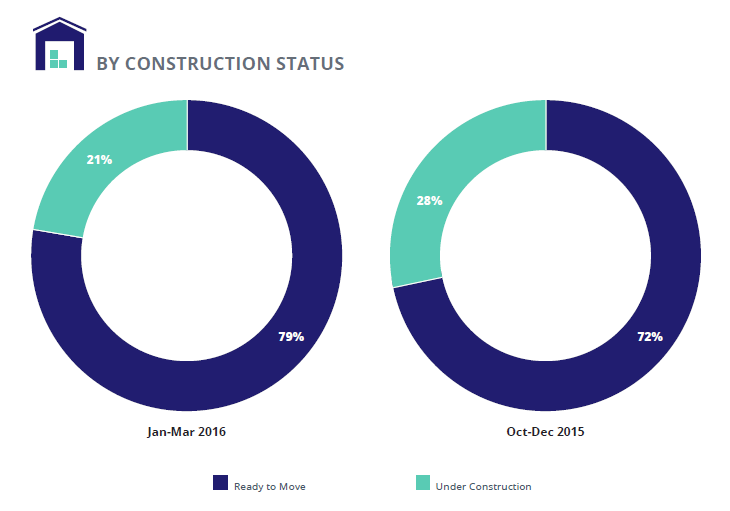 Supply of under-construction properties continued to dip significantly in Hyderabad. A seven per cent dip was registered in the first quarter of 2016 . Despite better market sentiments, developers are wary of launching new projects. Majority of the new launches that have taken place have been by non-local players, which have entered the Hyderabad market for the first time. Nearly 40 per cent of the ready-to-move-in properties are available within the budget of Rs 25 lakh, while under-construction properties are majorly concentrated in the Rs 40-60 lakh budget range.